With this being my first post of 2014, I feel like I should have crafted mind blowing content, an outfit that knocked your socks off or a handful of resolutions that I most likely would not fulfill, but I didn't. I am here today in simple form with a classic style and ideas about what I want from the new year that has landed upon us. I really did sit down and brainstorm on what I wanted to share in this first post of 2014. Quite frankly, zero brilliant topics came to mind. I guess the holiday hangover is still lingering. Being on the road, traveling off and on for over a week, I have had a lot of drive time to reflect on and digest the last year and what I wanted to change and continue to pursue. There is something so refreshing about starting a new year. You leave things behind, you wipe your slate clean, so to speak, and you set new goals and ambitions for yourself. I have never been one to make resolutions. To me, it's way too much pressure and setting yourself up for failure. Instead, I write down things I want to work on, strive for and do to become a better person, wife, mother, friend and follower of Christ. When I was driving to the deer lease on Sunday morning, I listened to my pastor's live sermon on my iPhone. Driving down back roads alone with Him and His word really hit me more than any other message I have heard at church all year long. The topic was peace. Finding peace through Him is the only way we can successfully live a life of happiness and contentment. So, my one goal, not a resolution, is to with a full heart, find peace in places where it's lacking in my life. I didn't realize how much this whole peace thing resonated with me until I listened to the sermon. I am not just talking about deep and complicated topics either. It's as simple as not getting in a tizzy because my kids are messy aliens and destroy our house in 2.2 seconds. Or because Ross brought home a dog that immediately stole my heart and then shipped him off to bird dog school for two months that left me broken hearted. Realizing that I am not a bad mom or wife because I don't whip up home cooked meals every night. Being okay with not being a lover of working out and probably never will be. Accepting the fact that I am totally unorganized, a little messy and that everything doesn't have to have it's place. Not feeling guilty about hitting delete on emails because they can't all possibly be answered even if we had double the hours in a day. Reminding myself that blogging isn't the end all be all and it will eventually run it's course. Of course, there are a few deeper, underlying pieces of my life that I need to let go of and work harder at as well. It's going to be a work in progress and daily reminder of finding the calm in life's ups and downs. I am ready to embrace solitude and serenity, to not harbor moments or circumstances that I cannot change, but move forward with a positive outlook, heart and spirit in 2014. And as corny as this may sound or seem, take the advice of Disney's Frozen and Demi Lovato and "Let It Go". Great motto to live by Shanna!! I have a very similar attitude towards life and I think that's why I am such a happy go lucky person. Wishing you the best to come in 2014!! BTW - love these flared jeans on you - they make your legs go on for miles!! Loved this post - such a great goal for the new year! Love the pattern mix in this outfit and I agree that it's a lot of pressure to set "resolutions" . I tend to leave mine a little bit on the general side as to not disappoint come December a year later. But, you nailed it what a great mantra for the new year! Finding peace is something I think we all could use a bit more. Good luck in your endeavor. A tweed jacket is one of those pieces that always gives a great statement touch to the outfits. You look gorgeous Shanna! LOVE this outfit and I love that blazer, you styled this perfectly! That is a really wonderful goal for this year! Sounds like it will make your life less stressful and more balanced. And THIS is why I love you!! Such a great idea and challenge! I think this is a great "resolution" for the coming year - mine is similar, to live more in the moment, and be a better person. Here's to a great 2014! shanna, i love this. and i want to start 2014 fresh and happy ready to take on the next challenge! thanks for always being so real! It is so important to do what you can to be at peace in all areas of your life. We can't all be good at the same things, and none of us are perfect - what fun would life be if either of those were the case? I love reading blogs where people are good at things I am not good at. It gives me a taste of those things and maybe inspires me to try a little bit in those areas, but I'm still realistic about my limitations. I don't want to be like anyone else, I just want to be like myself. And I want everyone else to be themselves too. Warts and all! Love this! Cheers to a great 2014.
great goal/resolution for this year. I tend to get worked up about things too so i'm going to try to be calmer and finding the joy in everyday life. happy 2014! I also kept telling myself...when the new year starts...I will get serious about blogging again. I thought...I will PLAN outfits in advance and get my posts done early so I can get to bed at a reasonable hour. So wouldn't you know it...I was scrambling yesterday to snap pics for today's post. And then was up until 1am finishing up a post for another deadline. Thank you for the reminder that my blog is NOT the end all be all. The blogosphere will live if I missed a day of blogging. I have to remind myself of that OFTEN. We put so much pressure on ourselves to do it all!!! BTW...you look AMAZING. I am OBSESSED with this jacket. And you should know that your first outfit post of 2014 knocked it out of the park girl! 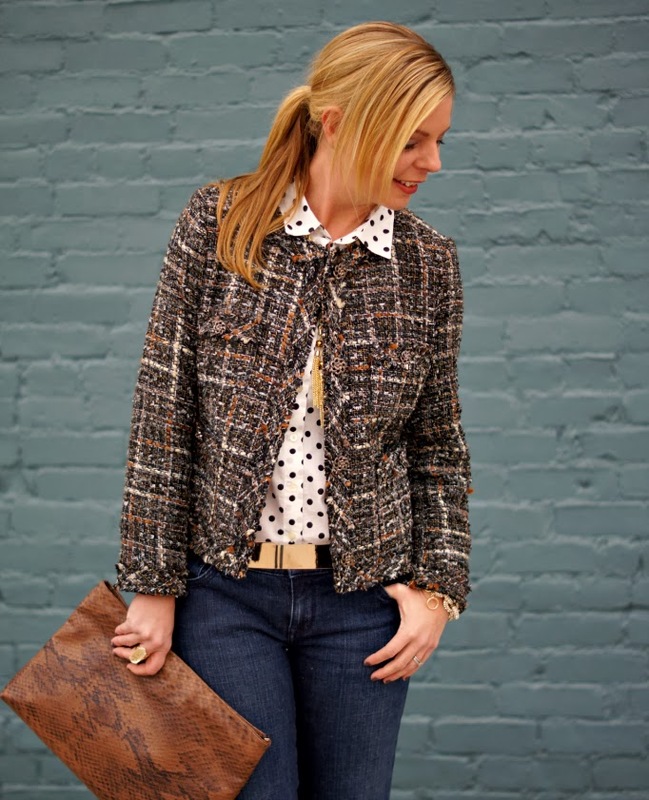 Ooh, I love this tweed jacket over the polka dots! Such a great pairing. Love this! The first thing that popped into my head when I read the title of this post was that song! I love it! When I did my morning devotions today I kept praying for peace. It just kept running through my mind. How applicable this is today. Thank you. Peace. His perfect peace is something I seek, but never seem to keep in my heart. When two of my fave blog friends choose rest and peace as their "goals" for 2014, I think God may be trying to tell me something. :) And, I love this outfit. It's fun to see you in bootcut jeans. Such a great post!! I hope to be able to stress a little less this year and enjoy things a little more. I would love to be a little more at peace with the way things are and embrace it. Hope you are having a good start to 2014 (and 2 months will fly by and Gus will be home soon... do you get to visit him?)! Happy New Year gorgeous lady! I always love hearing your positive outlook on life. Loving your polka dots! Right one! My goal is to let go of all the negativity in my life, whether it be people or feelings:) Happy new year! I LOVE your resolution! Best one I've seen so far. I totally need to do the same. I get upset and stressed out too easily lately. Love your tweed blazer and I've always admired your classic style so it's a perfectly fitting look for the first post of 2014! P.S. Thank you for your sweet comment on my last post - it really meant a lot to me!! Demi Lovato - I just fell even more in love with you. Love this post, Shanna. I certainly need to find peace in my life and stop second-guessing God. I have some difficult issues in my life right now, so thank you for the reminder to be at peace with things and trust God. I love this look, Shanna! 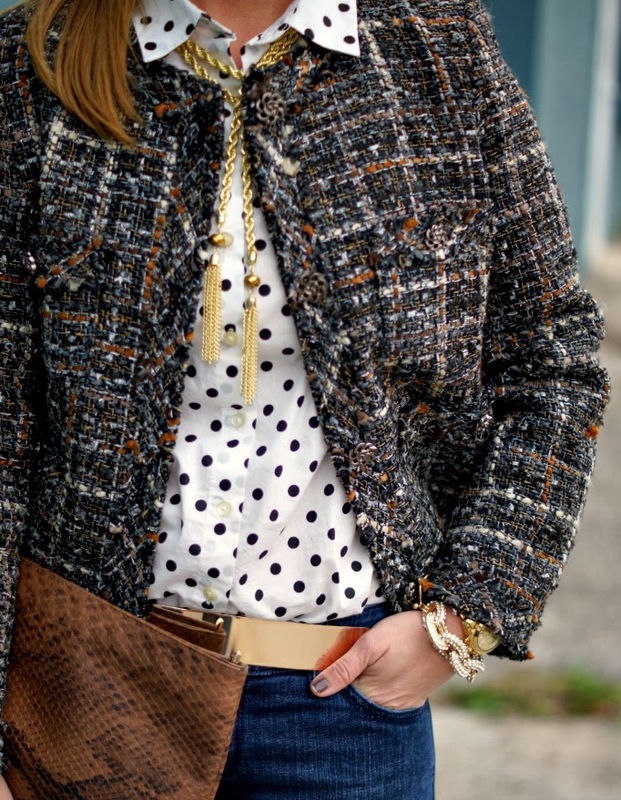 I'm totally obsessed with tweed jackets and I absolutely love the tassel necklace. I have a very similar one from Baublebar and it's such a fun piece. You've inspired me to wear mine in a different way! Happy New Year! This year my main goals are to graduate college and find a job. Right now I can't see anything beyond that! Great advice! Those jeans look fabulous on you! "Let go" has been a tattoo I've wanted to get for some time now. I see it as a constant reminder to let go of the things I cannot change, and always move forward. We can learn from our past, but we can't change it. We can only strive to be better, do better and find peace in the things we can change. Here's to finding peace and letting go - cheers, my friend! I love your list of things you want to improve! You're amazing, girl. Seriously! I think that is a pretty great resolution, and I really need to adopt it as well. I'm way too hard on myself sometimes, and I too have some things from the past that I need to let go of. On a lighter note, I love the tweed and polka dots! Happy New Year lady!